Pakistan became a lower-middle-income country in 2008 (World Bank classified) and it achieved a 4.7% GDP growth rate in 2015-16, with a per capita GDP of USD 1,429 (GNR, 2018). Agriculture accounts for 19.8% of Pakistan’s GDP, employs 42.3% of the total labour force, and 67% of the rural workforce is directly or indirectly involved in agricultural activities (WFP, Climate Risks and Food Security Analysis: A Special Report for Pakistan, 2018). It has a high dependency on food imports, largely driven by edible oil imports. Pakistan also spends around PKR 450 billion annually on direct and indirect subsidies to agriculture (IFPRI, 2017). • 45% of children under five in Pakistan are stunted. • It is off course to meet all the WHA targets to improve maternal, infant and young child malnutrition. • 20.5% of adult males are overweight and 6.3% are obese. • 20.7% of adult females are overweight and 11.8% are obese. Malnutrition is estimated to cost the economy nearly 3% of GDP per year, equivalent to PKR 704.3 billion annually (IFPRI, 2017). 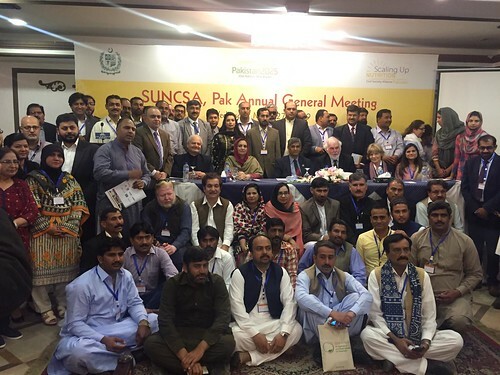 In February 2019, with support from the Benazir Income Support Programme, members of the Global Panel Secretariat undertook a week of bilateral meetings in Pakistan to develop relationships with partners and key actors and gain knowledge of the policy and technical context on nutrition and food systems in Pakistan. 1. High-Level ministerial meeting, held in partnership with the Benazir Income Support Programme, to stimulate action from Federal and Provincial Government to consider options to strengthen nutrition governance in Pakistan, and to support the development of policies that will reposition its food systems to deliver healthy diets. On the same day, Prime Minister Imran Khan launched 'Ehsas': the social safety and poverty alleviation programme, which includes the establishment of a multi-sectoral nutrition coordination body at the Prime Minister's Office. 2. 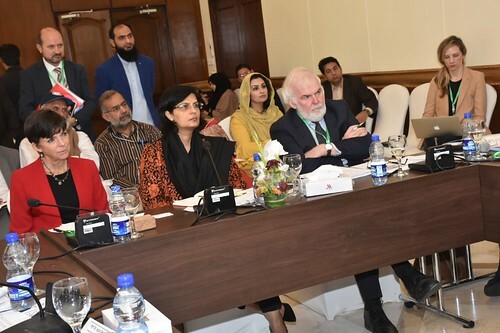 High-Level Roundtable, in partnership with the Benazir Income Support Programme, and with representatives from government, development community, CSOs and non-governmental organisations to build a better understanding of diets and food systems and to highlight the risks of inaction on nutrition. The meeting concluded with particpants signing a statement of intent, in which they agreed on advancing specific, actionable policy options within their spheres of influence to support the provision of safe, affordable, accessible and healthy diets. 3. DFID Pakistan all staff briefing to learn from the Global Panel Director, Prof Sandy Thomas, potential policy initiatives that can support the repositioning of food systems to deliver healthy diets in Pakistan. 4. Session at the Annual Planning Meeting of the Scaling Up Nutrition Civil Society Alliance in Pakistan to provide an overview of the Panel’s work on food system and diets. 5. Presentation of the Global Panel Policy brief on on evidence, recommendations and best practices around the prevention of nutrient loss and waste across the food system, and the implications for Pakistan.